Hallux rigidus is a condition in which the big toe is less mobile and feels stiff. 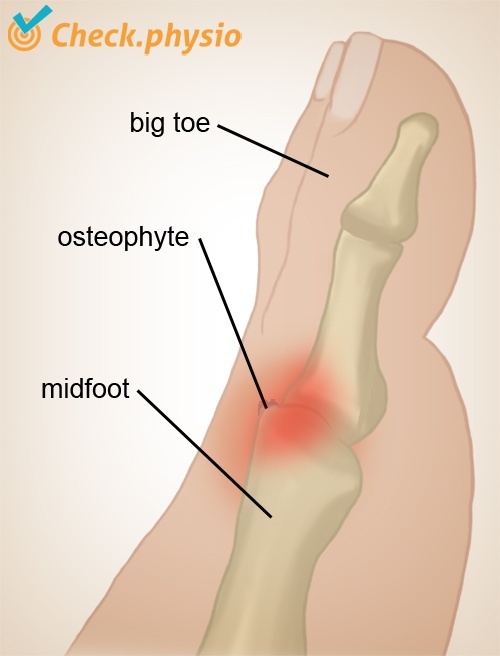 The pain is located primarily on the top of the base of the big toe. If symptoms persist for a longer period, a hard lump can develop on the top of the big toe. Although the symptoms of hallux rigidus usually occur in patients over the age of 50 years, as a result of osteoarthritis, the symptoms can also occur in young adults. In such cases the cause is often a sporting injury. This involves a painful loss of mobility of the base joint of the big toe (MTP-1 or metatarso-phalangeal-1 joint). 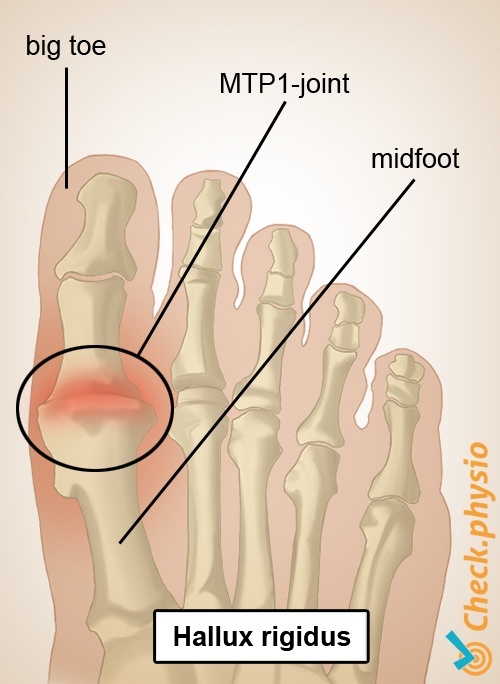 This is the joint that is located between the midfoot and the big toe. If the symptoms persist, a bump can develop on the top of the big toe. This is a bony growth on the bone and is also referred to as an "osteophyte". Normally, hallux rigidus does not cause an abnormal position of the big toe, as is the case with hallux valgus. The symptoms are more common in men than in women. In adults, hallux rigidus is usually caused by arthrosis (wear-and-tear of the cartilage in the joint). The symptoms can also be caused by an accident or fall, sports injuries, osteochondritis dissecans (a condition in which the cartilage and the underlying bone separate from the joint surface), recurrent episodes of gout, hypermobility or an abnormality of the metatarsal bone. Pain around the big toe joint, particularly along the top. The big toe feels stiff and is less mobile. Pain when extending the big toe (moving the toe upwards). A bump may be visible on the big toe. Sometimes the big toe is swollen. The pain occurs whilst walking and people have the tendency to walk on the outside of the foot to avoid the pain. Treatment can consist of modifications to the footwear. A wide shoe with a rigid sole is recommended. Placing insoles in the shoes or a rigid Morton's extension under the sole can alleviate pressure on the big toe. The use of anti-inflammatory medication is sometimes useful. In severe cases, a surgical procedure can be considered.